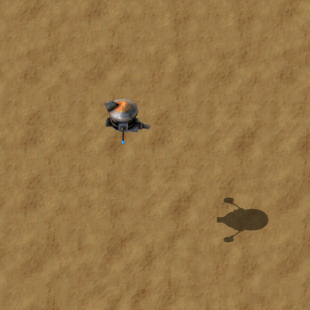 A basic capsule which, when used, will spawn a single defender robot. The defender has infinite ammunition and will follow the player, attacking any enemies that come within range, until it is destroyed or its lifespan elapses. Follower robots will only loosely follow the player and are subject to inertia. This allows the player to 'swing' packs of follower robots into enemy bases to damage enemy structures with less risk to himself. Launching distractor capsules into the enemy base, as well as using the speed of the car or exoskeleton can further reduce damage to the player. Defender being spawned and following the player. The maximum number of active Defender robots is limited by the follower robot count research. While using follower robots, the number of robots in-use will be visible on an icon to the right of the quick-bar. Hovering over the icon with the cursor will show the types of robots and the currently researched maximum.